Connect external audio devices to your B&O BeoPlay A8, A9 or BeoSound 8. Eg. from a TV, Hifi or any other device with RCA/ Phono output sockets into your Bang and Olufsen system using its AUX Line input sockets. 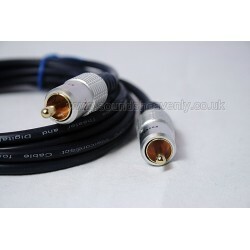 This cable will allow you to connect a TV, Hifi or any other device with a Phono output socket into your Bang and Olufsen system using its Twin Phono (RCA) AUX Line input sockets. Simply disconnect any other devices connected to your BeoSound 8, BeoPlay A8, or A9 and it will switch to the Aux Input automatically! Ideal for BeoSound 8, BeoPlay A8, BeoPlay A9. Your BeoSound 8, A8, or A9 can be used as a link speaker in a multi-room Masterlink network by connecting it via the PC port of a Beolink Active link room controller. Please see our specific version of Beolink Active AUX input cable if you require this option.